Traditional Chinese Herbal Medicine works well in conjunction with acupuncture to treat underlying patterns that lead to diseases. Chinese herbal formulas are a combination of a few to many single herbs that are grown in and around China. Formulas have been found to be far more effective than administering the same herbs individually because the herbs work synergistically with each other. Some herbal formulas have been used for thousands of years; some have been altered slightly over the years to exclude endangered plants; and some formulas have recently been developed. 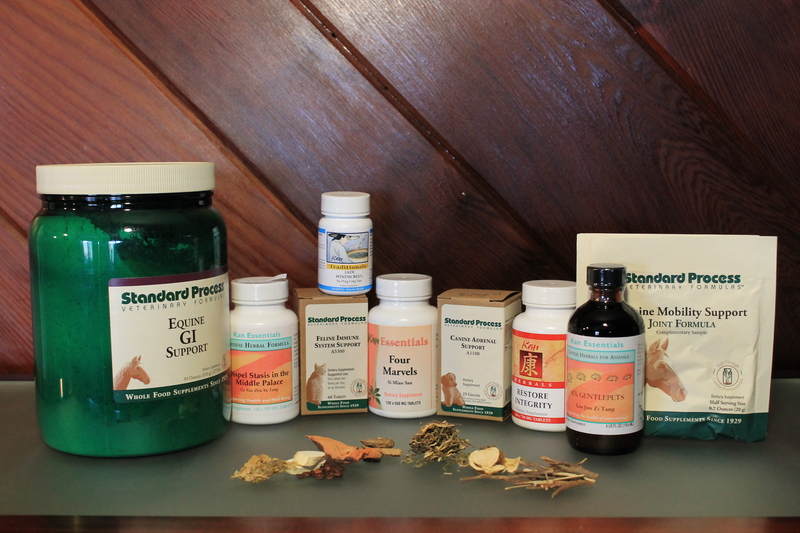 Unlike many “western” pharmaceuticals, herbal formulas rarely cause severe side effects. Their beneficial effects tend to be subtle at first, although this is not always the case. Prescribing a proper formula requires a detailed history and a full examination of the animal. Because Traditional Chinese Herbal Medicine addresses the fundamental cause for a symptom, it is possible for two dogs with the same symptom or disease to be treated with very different formulas. This is something that seems foreign to our typical way of thinking, where, for instance, two dogs with allergies are treated with a steroid to relieve the itching. In Chinese Medicine, the location of the itchy skin and the nature of the itchiness (ie. severe, mild) would be taken into consideration, but also a myriad of factors would be examined, such as the dog’s pulses, the color and shape of its tongue, sensitive acupuncture points, history of gastrointestinal problems, sleep patterns, preferences for cool or hot and soft or hard surfaces. From all of this, a unique picture of that animal forms and a specific formula is selected. Food Therapy is one of our most powerful tools in the treatment and prevention of chronic disease. Once acupuncture and/or herbal medicine has been instituted, it is useful to use food as a means of preventing a reoccurrence and making the body stronger as a whole, thereby preventing additional problems. For further explanation of the theory behind Chinese Food Therapy, you can visit the Holistic Veterinary Center website. Most mass-produced foods, from dog kibble to pelleted bird food, tend to have a heating and drying effect on the body, since these are the two main processes by which they are manufactured. Resultant diseases range from behavioral issues (feather-picking, anxiety), to skin disease (hot spots, skin infections), to gastrointestinal complaints such as vomiting or diarrhea. Home-made diets and raw diets with specific ingredients are sometimes recommended for the treatment of disease. Because this can be expensive and labor-intensive, a common diet manipulation tactic simply involves adding more fresh food to the dry food, thereby affording more moisture and coolness as well as higher quality vitamins and minerals.